Isaac Hagerling Wins Event #27: $3,000 No-Limit Hold'em Mixed Max ($372,387)! Prior to Event #27, Isaac Hagerling had three World Series of Poker cashes for a total of $14,393. After besting a field of 593 entrants, Hagerling can add $372,387 to that total. Hagerling made it to Day 3, the heads-up portion of the mixed-max format, third in chips and earned the No. 3 seed. With that, he held more than a 16:1 chip lead in his Round of 32 match against Markus Gonsalves. Hagerling made quick work of Gonsalves when the latter shoved with and was called by the former's . Hagerling improved to Broadway and punched his ticket to the Round of 16 where he battled Nick Binger. Of the eight matchups in the Round of 16, Hagerling vs. Binger went the longest. In fact, three of the four Round of 8 matches began while Hagerling and Binger were still battling for a seat. The back-and-forth match turned when Binger three-bet shoved for effectively 31 big blinds with . Hagerling called all in with , held up, and won the match shortly thereafter. He began his Round of Eight match against Yevgeniy Timoshenko nearly an hour after the other matches began and, as was the case in his match against Binger, his match lasted well longer than the rest. Hagerling held the lead for nearly the entire match and earned a spot in the semifinals after Timoshenko bluff-shoved the river. The board read and with about 190,000 in the pot, Timoshenko moved all in for 388,000. With about 770,000 behind, Hagerling gave it some thought before calling with for trip nines. Timoshenko was bluffing with ten-high, setting up a matchup with Jeremy Ausmus. Ausmus had been waiting for several hours for the matchup and jumped out to a sizable chip lead. However, Hagerling doubled with pocket tens against Ausmus' ace-ten after the chips went in on a king-high flop. On the last hand of the match, Ausmus check-raised all in on the turn of a three-spade board, and Hagerling called with a queen-high flush. Ausmus was drawing dead, meaning Hagerling and Max Steinberg would battle it out for the bracelet on Day 4. The battle went back and forth for the first 69 hands before Steinberg evened out the chips with a queen-high bluff-shove on the river. 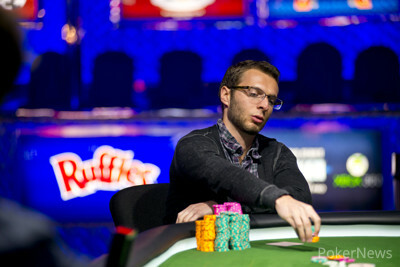 Just three hands later, Hagerling called all in for his tournament life on a board with . He was crushed by Steinberg's , but caught an unlikely on the river to take a commanding chip lead with 97% of the chips in play. The match would last another 34 hands while Steinberg battled back, but ultimately Hagerling sealed the deal. 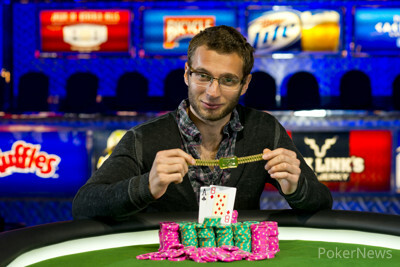 Congratulations to Isaac Hagerling for winning his first WSOP bracelet and earning nearly $400,000. Thanks for sticking with us here at PokerNews.com. Until next time, good night from Las Vegas! Hand #105: Isaac Hagerling moved all in, and Max Steinberg folded. Hand #106: Hagerling received a walk. Hand #107: Hagerling raised and Steinberg called all in for around 500,000. Hagerling held as the board came , and was crowned champion. Steinberg will take home $231,501 for his efforts. 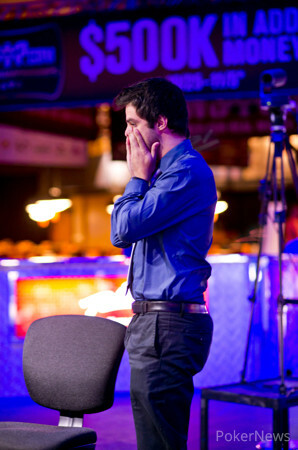 Hand #102: Max Steinberg limped in on the button, Isaac Hagerling checked, and the flop fell . Hagerling led out for 65,000, Steinberg called, and the turn was the . Both players checked. The completed the board, and Hagerling check-folded to a bet of 125,000. Hand #103: Hagerling limped in on the button, Steinberg raised to 130,000, and Hagerling moved all in. Steinberg folded. Hand #104: Steinberg limped in on the button, Hagerling checked, and the flop came . Hagerling checked, Steinberg bet, and Hagerling check-raised to 150,000. Steinberg folded. Hand #101: Isaac Hagerling limped in on the button, Matt Steinberg checked, and the flop fell . Steinberg check-called a bet of 55,000, the turn was the , and Steinberg checked again. Hagerling fired out 150,000, Steinberg called, and the river was the . Steinberg checked, Hagerling fired out 500,000, and Steinberg folded. Hand #97: Max Steinberg received a walk. Hand #98: Steinberg limped in on the button, Isaac Hagerling checked, and the flop fell . Hagerling check-called a bet of 45,000, and the turn was the . Hagerling checked, Steinberg fired out 235,000, and Hagerling called. The completed the board, Hagerling led out for 575,000, and Steinberg called. Hagerling showed for a straight, and Steinberg had the same hand with . Hand #99: Hagerling raised to 100,000, Steinberg moved all in, and Hagerling folded. 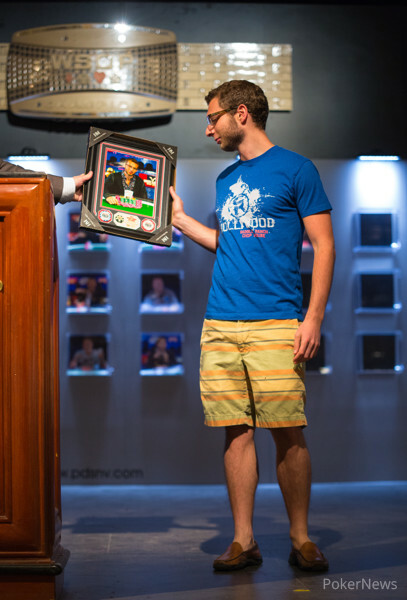 Hand #100: Steinberg raised to 80,000 on the button, Hagerling called, and the dealer fanned . Hagerling check-called a bet of 90,000, and both players checked on the turn ( ) and the river ( ). Hagerling showed for a pair of jacks, winning the pot.